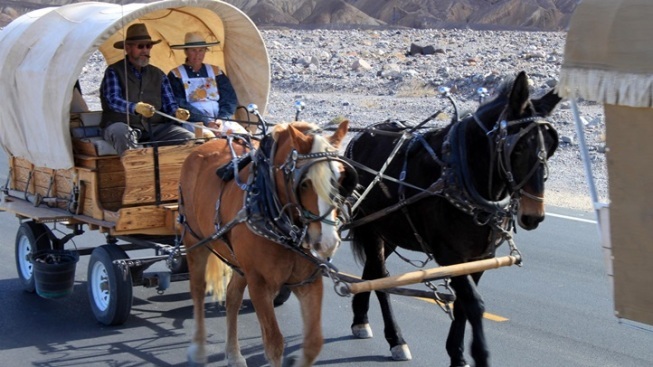 Early gold-seekers are remembered near Furnace Creek. Death Valley, circa 1849: History-minded cowpokes and 19th-century proper gentlefolk make for the national park to remember the Gold Rush. Dates? Nov. 5 through 9. FAR, FAR IN THE FUTURE: If you'd asked someone crossing Death Valley back in the middle of the 1800s what Nov. 5 through 9 might be like, circa 2014, they'd probably scratch their chin and ponder far into the future, imagining wondrous things. Whether those wondrous things have come to pass is up for discussion -- many have, for sure -- but here's a certainty: People on Nov. 5 through 9 will be thinking back, across the same time span, pondering the lives and dreams and travails of those 19th-century adventurers who crossed the very hot, very dry expanse in the hopes that they'd get rich. Very rich, in fact: The Gold Rush was on, and the area that would one day become a famous national park saw its own share of wagons and miners and the people who had glittery dreams. Modern history lovers remember those '49ers each year with an encampment, complete with old-school costumes and boots and wagons and such. It's such a sight, and while you don't need to sleep out under the stars, you can make for Death Valley National Park over the first weekend of November to remember those bold journeys to gold. AS FOR NOT SLEEPING UNDER THE STARS?The Ranch at Furnace Creek has a package on that includes a souvenir program, a ranch BBQ dinner, and some other goodies, with some asterisks (like you have to stay for at least three nights). As for the encampment itself? It's rootin' and, yep, it is tootin', and it is year 65. So look for a horseshoe contest, Western art, twangy tunes played live, and a bunch of ye old merriment, with a California-meets-Gold-Rush flavor. How did everyone cross Death Valley back in the day? And did they dream of the future? Well, yes to that, though whether those early travelers pondered 2014, specifically, may be lost to the proverbial sands of time.